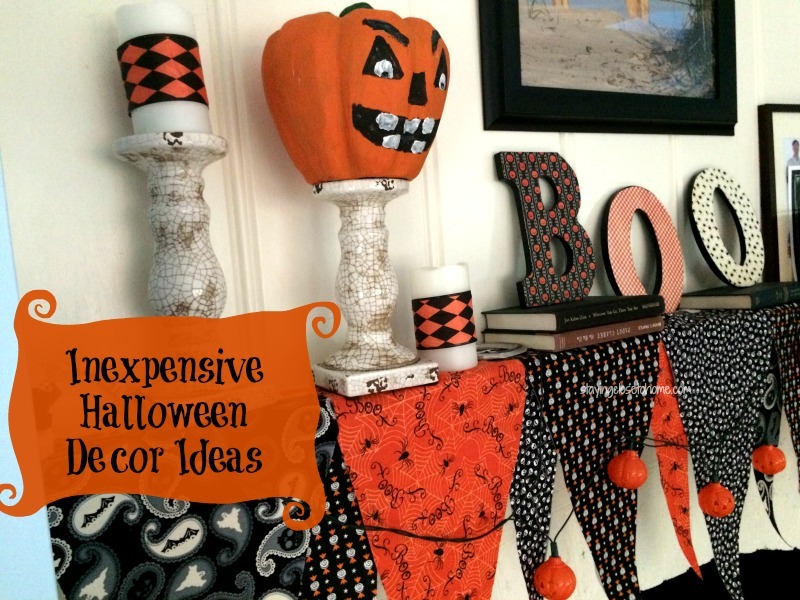 I am a Wayfair.com Homemaker and I was provided a some cute halloween stuff in return for this post about making DIY Halloween Decorations.. All opinions are 100% my own. 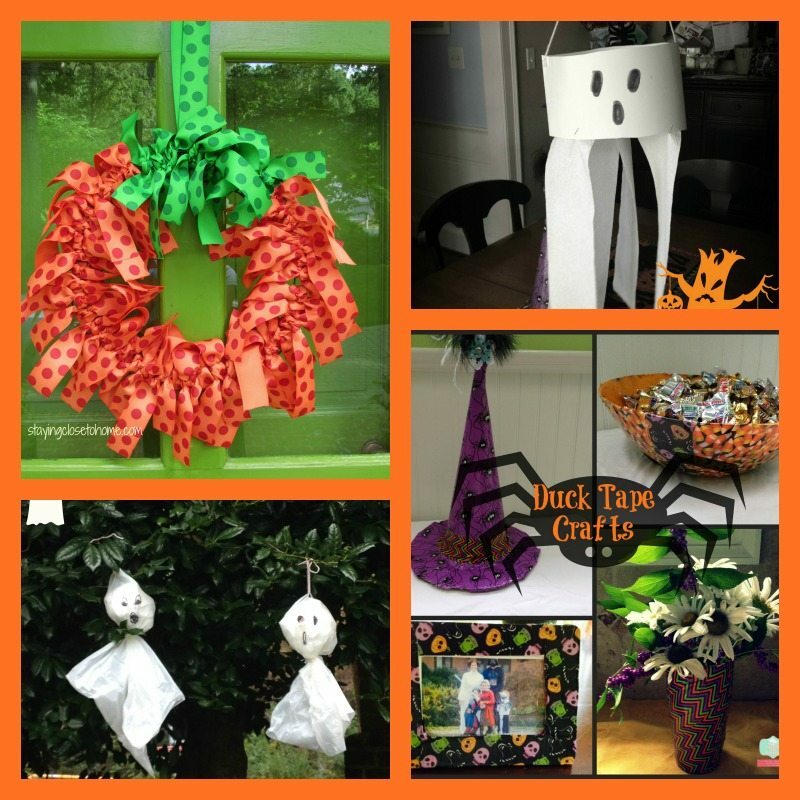 Halloween is a few days away and you might be looking for some ways to create some extra flair in your house before the trick or treaters arrive. I thought I would share some of the inexpensive Halloween Decorations we made for our house. Can’t wait to hear about your favorite halloween decor projects. First up is my new mantel decor this year. For the longest time I was using the same string of dollar store skeletons but they broke this year so I have rearranged things and moved my skeletons somewhere else. (coming later in the post) If you have not seen the tutorial for this no sew Halloween Mantel decor be sure to check it out. The fabric for these have to be close to clearance this far into October as the craft stores bring out all their Christmas items. Visting our local craft store I found these large Black wooden Letters 2 for $5. Immediately I thought about Halloween and to keep things reasonable purchased 3 letters, you guess it B-O-O. Not all that original but like I said wanted to keep the an inexpensive Halloween decoration. I also purchased 3 different Halloween themed crafting papers. TIP: if you don’t see a design you like, always remember to flip over the pages most are double-sided. Make sure you have a glue like Modge Podge as well. I traced the letters onto the papers first. If you are tracing on the back side of the paper make sure the letter is backwards. Trust me I made that mistake already. 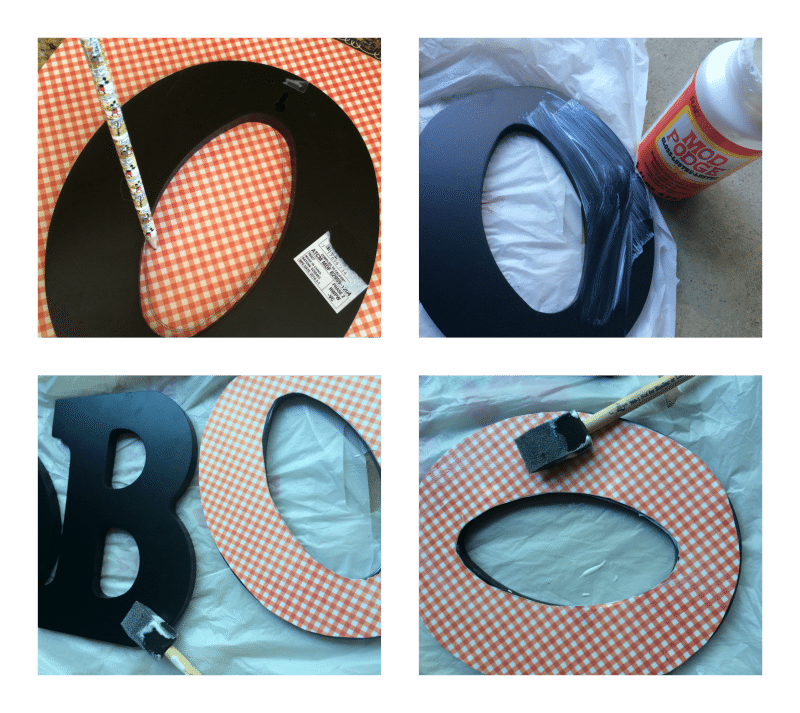 Then paint a layer of glue the letter and place the cut out letter on the wood letter. Be sure and press down and take out any bumps in the paper. Once that dries, cover the paper with another sealing coat of Modge Podge. I told you this was easy and under $10 . Be sure to check out the no-sew Halloween Mantel cover too. I also recently purchased these candle holders from Wayfair.com . 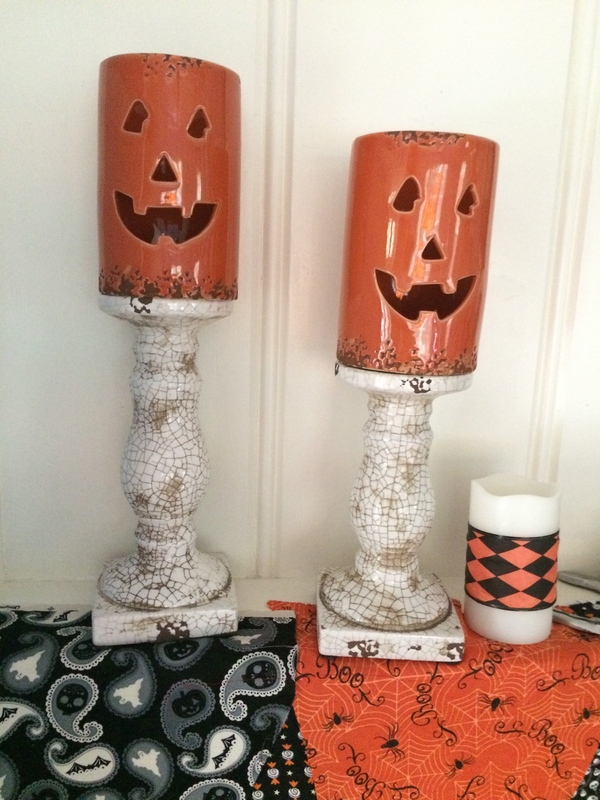 Trying to make a decorating hack from another catalog which used black candlesticks, I thought these would be good all year round. Use ribbon and just tape it around the candles for some extra holiday flair. 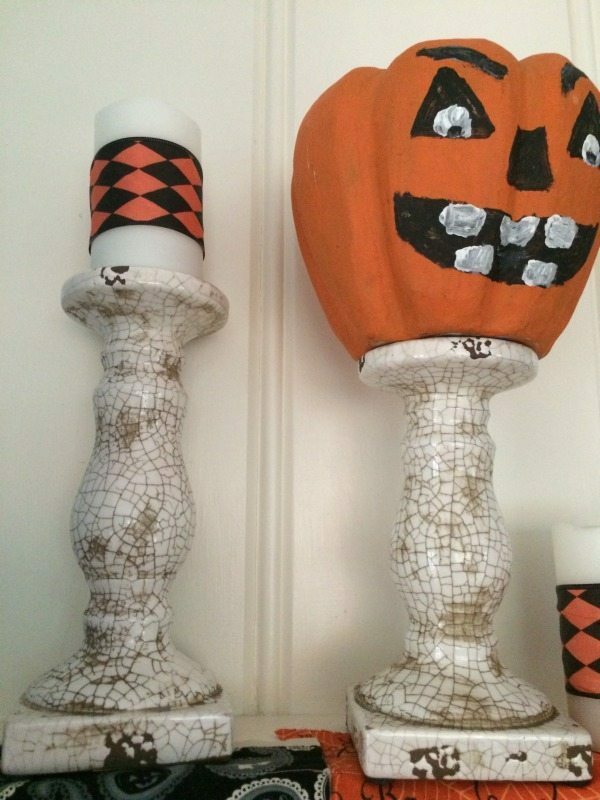 Also found at Wayfair.com are these ceramic pumpkins. I just have fallen in love with the brand Oddity. They have such great products and well made. They fit perfectly on the ceramic candlesticks but I worried a ball or something might hit the mantel and I would lose both. 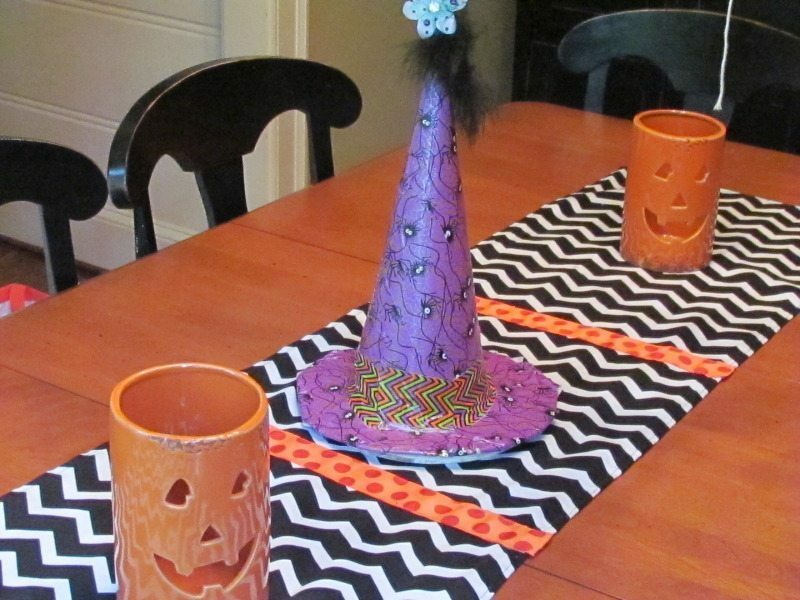 Halloween Table Runner: I decided to add them to my $5 runner I made from a remnant from the fabric store. If you can sew straight lines, you can make one of these. Because I did not want to buy enough fabric to get the length, I just pieced it together and added the ribbon over the seam. Told you this is easy and a modern update to our kitchen. Remember I mentioned those dollar store skeletons. I cut the garland and hung them from my chandelier. Just creepy enough to say Halloween but not enough to scare anyone. I would love to see how you decorate around your house over Halloween. 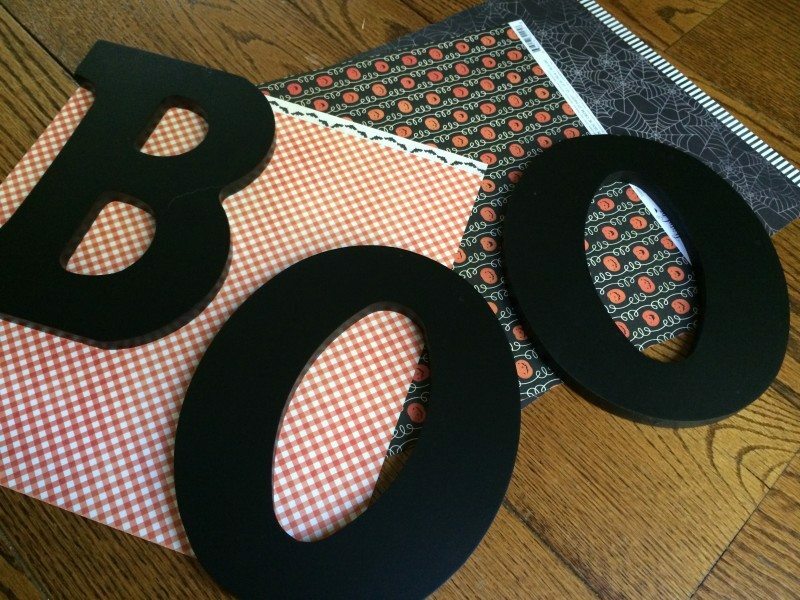 Here are a few other fun and inexpenisve Halloween Decorations for your next DIY project. The decorations were beautiful I love the different fabrics that you used worked great! I love all the decorations. I love decorating on a budget. Ok, that is seriously cute! 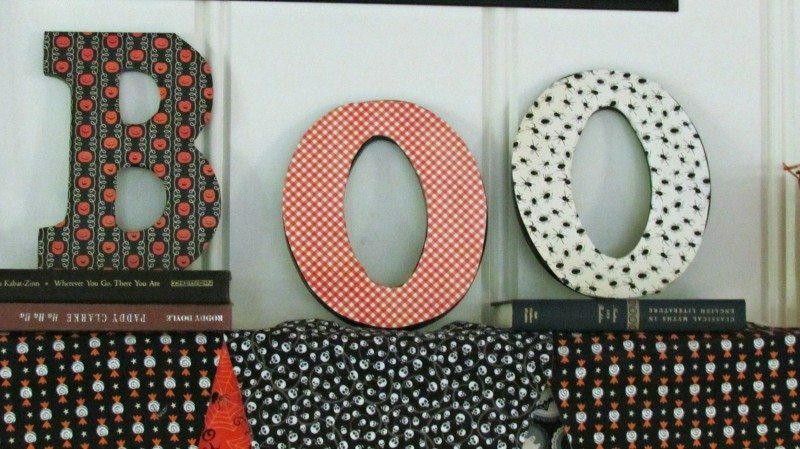 I want those boo letters in my life! I love all your awesome decorations! 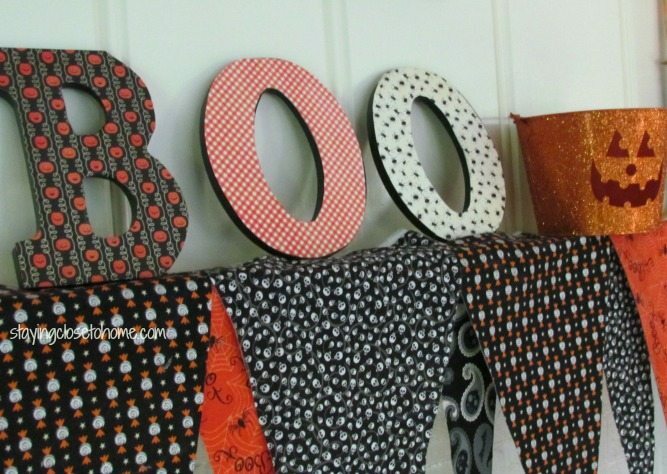 That Boo sign is so pretty and creative! Good luck with winning all! Love all of your decorations! I really need to keep these in mind for next year. Decorating always seems so expensive so I just don’t do it – but I really WANT to. I love your mantel, it is festive without being gross, and I love that it didn’t cost a lot to put together. Really like that mantle scarf, need to make one for my entertainment center. These are all great ideas and I absolutely love the wooden letters! I definitely want to give that project a try! Love all of the decorations. the witches hat is defiantly a great centerpiece. Love your decorations! Halloween decorations are a big reason I love fall! 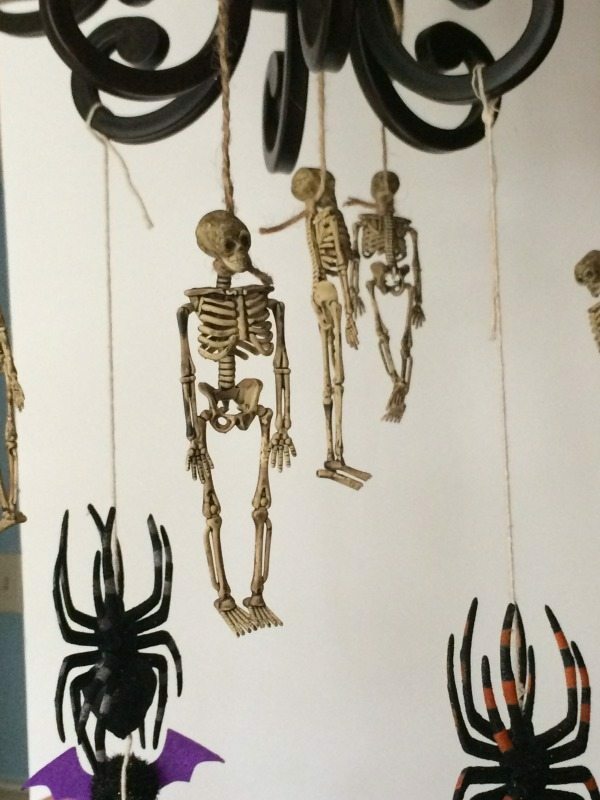 I love how you hung the skeletons from the chandelier! That’s creepy, but classy! I love all of the decor items you featured. Great job! You are so festive!! I love all of your decorations.